Hold your impulse to load up Google for a moment and try to guess what you just read. It’s difficult to say whether this is the least-read portion of American law, but it is certainly among the least-understood. This is the Ninth Amendment to the U.S. Constitution, and it is time that American Christians appreciate it. See, an important concern for the Drafters of the Constitution was that the specific list of enumerated powers they granted to the federal government might one day lead to confusion over the scope of federal authority. 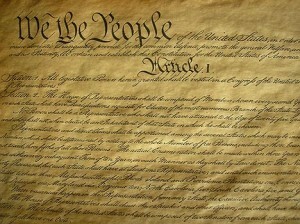 Rather than restrict the given rights of citizens to those explicitly referenced in the Constitution, thereby allowing for the future possibility of institutionalized tyranny under the guise of “Constitutional silence,” James Madison proposed the inclusion of statement of clear recognition that the full scope of human rights are not defined by human government. Not only would this protect against the state being free to deny rights originally unconsidered by the Framers in Philadelphia, but it would free those same men from the burden of having to try and list every particular right that a person is bound to have; this concern developed into the Ninth Amendment. But since then, number Nine has been warped into a tool for precisely the opposite end. In part, this turn is a matter of empty election season rhetoric. Whereas desires can be proven gratuitous, and neglected needs can sometimes be justified, the language of rights necessarily carries the discussion into the ethical realm of right and wrong. The importance of a human right is embedded deep within the American psyche, so campaign promises will often drill down into that rich soil for the extra emotional purchase it can afford. The problem comes when suddenly every element of political and legal interaction is couched in rights language: when you flood a market with anything, its value plummets. Human rights are a very real, very important thing – this is why we must not besmirch their character by casually labeling everything we want as such. Moreover, we must not limit the transcendent importance of human worth (as defined by the rights we are owed) to be guided by the public recognition of the State. The Framers recognized this, and included Amendment Nine into the Bill of Rights as an indication of their appreciation that no government can give a citizen a right, but rather that rights are something inherent to humanity. As Jefferson wrote in the Declaration, we are all equally “endowed by our Creator with certain inalienable rights…” no matter what government we sit under. This should ring loudly in the Christian’s ears. The Christian view of government should always recognize its subservience to God. It is a rather backwards view of politics to expect that the State should function as the source of our dignity and value (for what else do rights give us if not that?). Amendment Nine offers the explicit recognition that humans are worthwhile regardless of the government’s recognition of them as such, a statement that every Christian should whole-heartedly cheer. This also means that we can sleep soundly, even if the law of the land does not have a numbered statute detailing my right to something: the true source of such a right, if it really is a Right, comes from a Far Greater Being indeed.